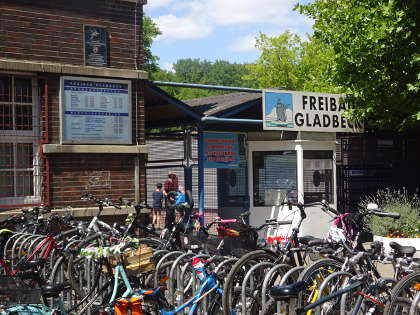 After nearly 2 years I was in the outdoor pool of Gladbeck on a sunny day in July. It is the first time where I took my bike. In my childhood my parents drove to this outdoor pool. In former times the administration of Gladbeck run this outdoor pool, now a little sports club SV 13 Gladbeck does the administration. The outdoor pool is located directly to the federal highway (B224) and the motorway (A2). You can take the bus line 188 to the station: „Stadion“. Here is a little stadium, too. But I bicycled from Essen and I did not take the train and the rest with the bike. It is only a short distance for me 15 km (9,32 miles). Normally you need only 45 minutes. My experience from the last year I took a bike path that goes directly to Gelsenkirchen Horst. But today (and for a long time) there a construction works and the administration showed an alternative routing. The first two traffic signs were available but the third one they have forgotten and I drove to another street and did not know where I was. I have asked a pedestrian but the woman did not know the place where I want to go. I made a detour through Gelsenkirchen Horst and could find the correct street in order to go the outdoor pool. The parking area for bikes in front of the outdoor pool was full but I could find a place for my bike. During hot summer days there were a lot of cars on every place where you can imagine. But today for me it was very warm but there were not so a lot of swimmers in the outdoor pool. There were a group of lifeguards in the pool for lane swimming. Some of them had to carry a dolly in the water where they have trained the rescue. They did a long training. Two hours in the water, no break, two hours only swimming. That was impressive. In my short holiday in Belgium, in Oostende in 2015, there was one day in the saltwater indoor pool a group of lifeguards, too. This outdoor pool in Gladbeck has a 50 meter (54,68 yards) pool still a 100 meter (109 yards) pool, too. This is not normal in Germany. But this 100 meter pool was not deep. The water has reached my navel. My towel was on the grandstand of the pool on stones because then you have a good overview from it to the pools and when you are in water you can watch to your own things, too. The important valuables were in the locker. I was not sure about the security here because in a lot of pools there are security people in order to control the situation. In Germany there is always in outdoor pools a little snack bar that sells chips and bratwurst (fried sausage). I never was in a foreign outdoor pool for example in the Netherlands, Belgium, France of Spain. I would to know what are there the typical dishes in an outdoor pool. In my swim breaks I read a paper book that I have bought me in Mönchengladbach for little money. It is a book about the „Testament of Dr. Mabuse“ from 1932. It has cost me 1 euro. This morning in the outdoor pool it was the best place in order to attempt to read it. I am not sure whether the dramaturgy is something for me. Normally I read science-fiction books. After 2,5 hours I have left the outdoor. Yes I was two times in the pool (50 Meter) in order to swim but I needed to have power for the return way to home. It was a good visit and it was not so very full. The lawn was still empty for such sunny day. Dieser Beitrag wurde unter English, Schwimmen abgelegt und mit 188, B224, chips, Gladbeck, lifeguard, Mabuse, outdoor, pool, Stadion, swimming, towel verschlagwortet. Setze ein Lesezeichen auf den Permalink.